2019 Apple Festivals in Indiana - Where, When and More to Find an Apple Festival Near You! Looking for a apple festival in Indiana in 2019? (just scroll down the page)There is no other listing as complete and current as this list, just updated! All the apple festivals in Indiana we can find are listed on this page! If you love strawberries, look for a festival near you below! And I'm always looking for more apple festivals! Please write me, if you know of any to add! I update the dates as soon as the festivals publish their information, but you can always click on the links (usually the name of the festival) to see the current information on the festival's own website. Bloomfield Town Park, Bloomfield, IN 47424. Email: [email protected]. Open: Click here for current open hours, days and dates. Directions: Click here for a map and directions. Payment: Click here for our Facebook page. Cory Apple Festival - The Cory Apple Festival is at the end of September every year. Cory, IN. You can buy apples by the bushel there and they have flea markets and craft stands. This festival is a huge hit and people come from miles around to go. They have a little bit of everything. . Comments from a visitor on August 09, 2008: "I love the festival and I know several other people that enjoy it too. The town, Cory, is small town living at its finest. And it kicks off the festival season here in western Indiana where we have the Covered Bridge Festivals as well. " Fort Wayne, IN. Celebrate the pioneer spirit of Johnny Appleseed (John Chapman) who planted apple trees in the Indiana frontier in the early 1800's. Nappanee, IN. Phone: 574-773-7812 and 574-773-7810. Fax: 574-773-4691. Email: [email protected]. Apples galore! Classic Car cruise ins, apple peeling contest, an apple bake-off, and antique fire truck show are just a few of the traditional events that make this festival great! Dozens of craft exhibitors, parade with bands, brightly colored floats and of course the Apple Festival Queen! There is no admission charge. Crates of the fresh fruit dotting the downtown sidewalks. Food booths run by the Rotary to the sororities. From fritters to cobbler and Dutch apple pie, you'll find no short lines, but plenty of time to catch up on the fall gossip. Sweet cider is the drink of the day and the apple butter boiling in the copper kettle can be taken home, if you're the patient type. Spencer Indiana. Held on the Square. There are a lot of craft booths and contests and a parade on Sunday at 1:00pm. P.O. Box 274, Woodbine, IA 51579. Email: [email protected].. From pies to pastries to slushies' to carameled, the last Saturday of every September is dedicated to a festival of everything APPLE! 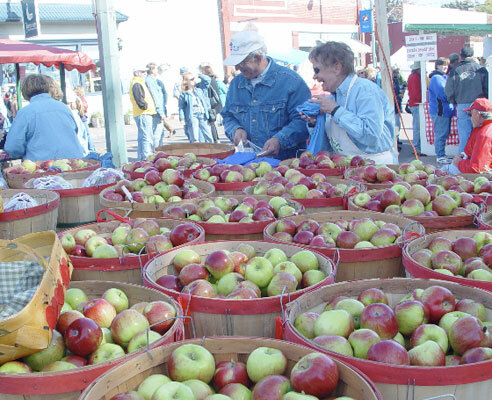 Located in Woodbine, IA, along the historic Lincoln Highway, Applefest has drawn crowds of nearly 13,000 people! Along with our apples, we host one of Iowa's largest car shows, which has attracted over 350 makes and models from as early as the Model T Ford! We put on a craft show and also support flea market and local business vendors... It's a great time to start your holiday shopping! If food is your passion, we offer a wide variety of delicious cuisine, sure to fit any taste! After the day is done, be sure to check out the entertainment at the beer garden located at 5th and Walker Streets. This event is sponsored by Tommy Gate and Good Fellows, and is a great way to relax after an eventful day! We hope to see you this coming September! Click here for a link to our Facebook page. Galena, IN.. This is the 22nd year for the event. There will be fun for all with arts and crafts, flea market, demonstrations, pony rides, petting zoo and family games. There will be a kiddie tractor pull with registration both days at 1 p.m. with the pull being held at 1:30 p.m. There will also be pumpkin painting, hayrides to the pumpkin patch to pick your own pumpkin, or pumpkins available in all shapes and sizes. "Ol Hess" the magical clown will be on the grounds both days from 11 am to 4 p.m. making balloon animals and doing his magical tricks. Antique gas engines and tractors will have a "Show & Swap Meet" both days. Plenty of food will be available outside under the tent, including barbecue, country fries, fish, brats, chili and bean soup, cornbread, chicken and dumplings and much more. Inside the restaurant there will be fried chicken and roast pork dinners. Also available will be apple dumplings, pumpkin pie and fried apple pies. Caramel apples, as well as plenty of plain apples, will be available for purchase at the farm market. Riverside Cloggers will perform on Saturday at 1 pm, along with other dance groups. Rainbow Dance Group will perform on Sunday at 2 p.m. There will be live music both days as well. Directions to Stumlers: Take I-64 west to Exit 119, go to Galena and turn right onto Navilleton Road. Follow Stumler Orchard and Restaurant's red and white signs.